A gracious 18th Century house near Bath, set in 36 acres of grounds landscaped by Humphrey Repton, sounds about as good as it gets for an hotel in England. 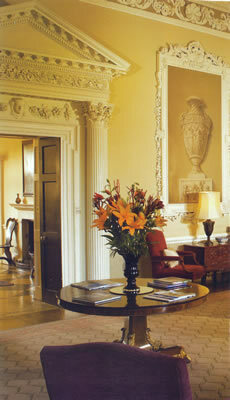 And Ston Easton Park has always been mightily good. I have known it for many years. But its various changes of ownership have not always served it well, so the Royce and I were keen to find out what was happening at our favourite Palladian mansion. As we turned into the drive and the façade of 1739 came into view, I was slightly anxious. But I need not have worried. All is well. Through the front hall and I was back in the Saloon. Its perfect proportions and fine antique furniture were just as I had remembered them. 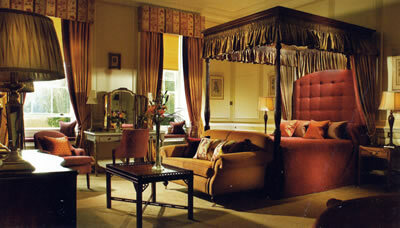 It must be one of the most elegant rooms in England. 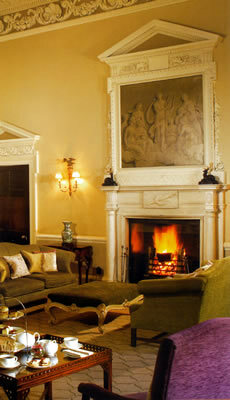 Indeed, all the public rooms at Ston Easton are just right. Apart from the Saloon, there is the Drawing Room, the Yellow Dining Room and the Library, and each is a perfect gem of Georgian domestic taste. Indeed, the Library still has its original mahogany bookcases and is the most charming, intimate space in which to sip one’s pre-prandial glass of dry sherry. I was billeted on the first floor in The Blue Room. (Note that there is no lift.) This was a Deluxe Room. (You will need to check the rates for specific dates on the hotel’s website.) At the rear of the building, the view through the casement window (with working shutters) was of gardens sloping down to a stream. The colour scheme was of blue (of course) and cream. This was very much a period apartment, with panelled walls, a marble fireplace, a free-standing wardrobe and pieces of antique mahogany furniture (including a bow-fronted chest of drawers). Above the fireplace was an oil painting a Georgian gentleman. I liked both the three-seater sofa and the large and very soft bed. Lighting was provided by six table lamps, wall lights and a chandelier. In the small tiled bathroom I found a bath of decent size (with a shower over), one wash basin and the loo. Ancient properties often, perforce, have little bathrooms, and this one was adequate for its purpose. Certainly, I was able to perform my ablutions comfortably before going down for dinner. The hotel’s panelled restaurant has been re-decorated and re-furnished since I last saw it, and its two rooms are now really quite swish. The napery is white, the crockery is by Jasper Conran, the glassware is by C & S and a single, tapered candle burns on each table. The service is both friendly and correct. I was looked after particularly well by Miranda, the Operations Manager. Much of the produce used by Chef Daniel Moon comes from the hotel’s own kitchen garden. And it is good produce. Mr Moon is a talented chef, who clearly knows how to handle his ingredients with skill and flair. His cooking was very much to my liking. 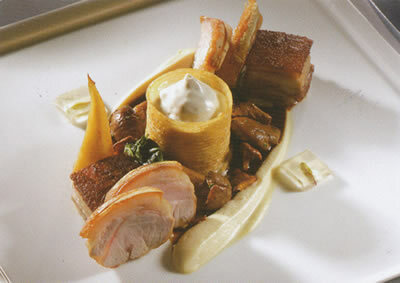 A three course menu is offered at £49∙50, but I chose the four course menu at £55∙50. I began with roasted breast of quail, with a quail’s egg, celeriac and black pudding. This combination of quail and black pudding was new to me, but it was highly effective, each element reinforcing the other. I liked the presentation, too – on a square white plate. I was less taken with the presentation of the next dish. The sautéed scallops, poached salmon and asparagus were precisely cooked and combined in a most delicious manner with some good Hollandaise sauce. But all were bundled into a small bowl, instead of having room to expand on a large plate. I hope the Chef will re-consider this presentation. No such problem with the lovely lamb – which arrived shortly after an elderflower sorbet had cleansed my palate. This was a rich and satisfying dish, the fine roasted meat (best end) matched robustly with wild garlic risotto and set off by spring vegetables. I had seen my pudding going to other tables, so I asked for it to be served on a white plate rather than the kitchen’s chosen wooden board. I was glad I did, for I was thus able to enjoy to the full the splendid chocolate fondant, with rhubarb sorbet and sorrel. The wine list is short and to the point. 80 offerings span the New and Old worlds. Prices run from £26 for a red (merlot) or white (sauvignon blanc) from the French d’Oc region to £398 for a half of 2001 Yquem and £345 for 2004 Cristal champagne. Other bottles to catch my eye were: from the Rhone 1996 Hermitage, Guigal (£198), from the Sonoma Coast 1999 Chardonnay, Williams Selyem (£98) and from the Veneto 2009 Amarone della Valpolicella Classico, Corte Saibante, Poggi (£126). My own drinking included a smooth and nutty St Emilion (Ch Haut-Gros-Caillon, 2010 (£34, half). With such good food and such interesting wine, this was a jolly good meal. And my breakfast next morning was jolly good, too. The dining rooms were quiet and calm, and the smiling waitress courteous, as I helped myself to fruit salad and cereals from the buffet. To my table the lady brought porridge, with brown bread and butter and chopped raw onion (a combination beloved of my grandfather), and smoked haddock with sautéed mushrooms. The brioche was good, and a special star must be awarded to the marmalade, which was wonderful. 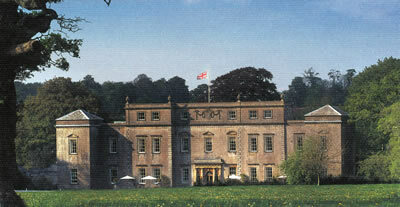 As we purred back along the drive on our way home, both the Royce and I were pleased that Ston Easton Park is prospering. It is a beautiful property. Ston Easton, Bath, Somerset BA3 4DF, England.